As the turmoil at the University of Virginia over the firing of their President continues, some of the underlying philosophical divides that drove the action are becoming more apparent. A piece in the Washington Post suggests that alumni of the Darden Business School at U-VA had some major impact on the decision, and that there was some feeling that departments who were not “paying their way” should be discontinued. The article suggests that the cuts would be in liberal arts programs and the classics, and there is a strong defense for continuing such programs. I am not going to go into all the reasons why we still need liberal arts programs, they do very nicely at defending themselves and sustaining their presence on campus. However it becomes something a little different when science and technical programs are concerned. My own alma mater, the University of Leeds was provided with a building by the Mining Industry and the last time I went it was occupied by the Art Department, while no-one was quite sure where the last remaining Mining faculty member could be found. (He apparently no longer even has a phone number). Mining is still a valid occupation, there are vast sectors of the world’s industrial might that would disappear without the material that mining produces from the earth. But that is society’s secret shame, and thus the technology is not defended with the passion that comes from those who seek to retain the classics on campus. (Even though Mining was often one of the founding disciplines of many such a campus). With the globe vitally dependant on coal, for example, how many universities in the UK teach mining? How many in the USA? Have these numbers grown or shrunk in the last decade? A little personal information – I retired as a senior faculty member in Mining from a mid-Western University a couple of years ago, and had given a year’s notice before I left. So far they have been unable to find someone of adequate qualification to fill the position I left. In fact, due to a similar shortage of faculty who know about taking the ore after it is mined and transform it into the metal used in factories, a discipline known as Mineral Processing, the position will likely now be filled in another group. The discipline that I was fortunate to focus in, that of making holes in things and then stabilizing them led into the use of high pressure water as a tool for excavation. And not just in coal, where I began, but also for tunnels and underground excavations. It is now a multi-billion dollar growth industry with an increasing range of applications. (I was at Logan airport recently and two surgeons were discussing its new use in a medical application, one of the more fascinating areas I found myself in – it can be used, for example, to discriminately remove cancer cells from skin, a technology for which I share a patent). Much is made of the fact that continued extraction of fossil fuels at a reasonable cost depends on new technologies as the resources become less concentrated and more expensive to produce. Whether it is the rare earths needed for modern “sustainable” energy producers, the components for advanced batteries or even that mundane black stuff that powers most of the world’s economy it has to be extracted from the ground to be of value. But to create new technologies, you have to some understanding of the current ones. And that requires both knowledge and experience, and within the universities of the country this is becoming a much rarer commodity in the fields that deal with fossil fuels. Do they teach this at U-VA? Well, no – you have to go to Blacksburg and Virginia Tech to find a program in the state (admittedly a good one) but the community is small enough that there is no clout in State or Federal legislatures to sustain a larger program. 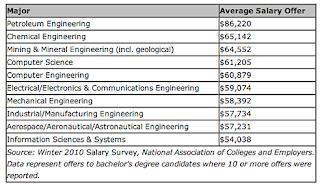 It is not as though the profession is not in demand, a couple of years ago the average graduate with a bachelor’s degree was starting at a salary of $48,351 petroleum engineers were starting at $86,220 while mining engineers average $64,552. Table 1. 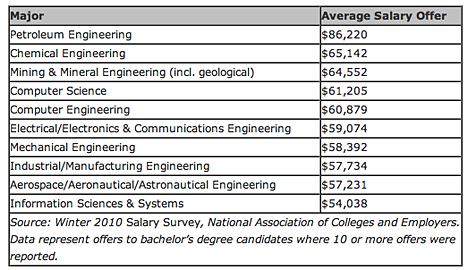 Average starting salaries for those with bachelor’s degrees in 2010. (Top 10). The reality is that politics are much more important at the University level is controlling what courses are taught or sustained on campus. At U-Va it is rumored that Dr. Michael Mann – he of the Hockey Stick story on recent temperature rises - (convincingly refuted by A.W. Montford) was to be offered the Kington Chair at U-VA - though with Kington now resigned as vice rector the fate of the chair may now be more in doubt. Makes it sort of unlikely that they will have a fond spot for mining, I suspect. Ah, well nothing much will change, so why get upset – time to find a more interesting topic.